Car Care & Frequently Asked Questions | Maintain Your Car. Allow a few seconds fo videos & or images to load. 1) Check your owner’s guide and find out when your scheduled car maintenance services are. Usually maintenance is done every 30,000 miles and it involves checking or replacing parts like spark plugs, wires and timing belts. Down the line, other major parts may need replacing in order to keep your vehicle running efficiently and safely. Wear & tear can naturally occur based on usage of vehicle. While it may cost a little more, scheduling service through your dealer not only guarantees genuine parts and expertise, it also keeps your service history in line and up to date, which will attract more buyers and higher prices when it comes to selling your car. 3) Oil change, this is one of the simplest car maintenance services you can do to keep your vehicle in good running condition. Not maintaining it could void your warranty and even cause an engine failure, which can cost thousands . Keeping your cooling system in working order is also important. This is also a good time to have a system flush. Having the pump, hoses, fluids and belts checked is also part of proper cooling-system maintenance. 4) Check your tire pressure. Invest a few dollars in a tire gauge and check your tire pressure regularly (including the spare). This helps improve fuel efficiency, cut down on tire wear and tear and lets you know if your vehicle is aligned correctly. 5) Washing not only keeps your vehicle looking good, it's also a good way to maintain that new-car finish. Layers of dead bugs, bird drops, dirt, leaves and chemicals can accumulate on your vehicle can strip away wax and eventually paint. If you choose to wash your car yourself, it is not recomended to use household products, for example, hand soap, dishwashing detergent, furniture spray, or glass cleaner, which can also strip off the protective wax. Use products designed specifically for cars. 6) Try to remember, which & when scheduled maintenance is approaching. + – 1. Will it damage my vehicle If drive when the check engine light is on?. It is possible but often not usual, unless the light is flashing. A decrease in vehicle performance is possible. Recommended to have your vehicle serviced as soon as possible. Quicker servicing may lead to less repairs. 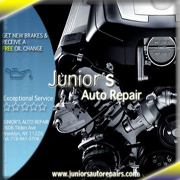 Is your vehicle in need of repair? Contact us today and schedule an appointment. + – 2. What can I do if my vehicle is overheating? If you are driving and the vehicle starts to overheat, turn off the air conditioner, turn on the heater and immediately pull over to the shoulder. The odds are if the vehicle starts to overheat, there is a problem in the cooling system such as low coolant, a clogged radiator or a broken drive belt or burst hose. Once at the shoulder, shut off the engine, open the hood and let the engine cool down for a minimum of 30 minutes. Once any heating stops and the engine has cooled, look for obvious signs of trouble. DO NOT attempt to open the radiator cap unless the engine is off and the top of the radiator is cold. If there is no noticeable problem such as a broken drive belt or burst hose, at this point if possible you can then add a coolant/water mixture to the radiator or overflow reservoir, then start the vehicle and drive slowly to a service station. + – 3. How often should the cooling system be flushed and coolant changed? + – 4. Why are my brakes making noise? Flush the cooling system and change coolant once a year. If you hear a grinding or squealing sound when pressure is applied to the brake, you probably need new brake shoes or pads. Brakes should not make any noise as they operate. Even if the actual problem turns out to be something minor, If your brakes are noisy it may be unsafe. Waiting to have brakes serviced is not recommended and could raise repair cost. If your brakes are making noise, it is recommended to have them inspected or serviced as soon as possible. + – 5. Will checking and changing oil affect vehicle performance? When should I change out transmission fluid and differential oils? No single step will help an engine last more than regular oil and filter changes will. Conversely, nothing will destroy an engine faster than neglecting oil-level checks or fresh-oil changes. While not requiring frequent service, these fluids must be changed according to service intervals. Always use transmission fluid or gear oil of the recommended type and viscosity. We also install a wide variety of after market accessories. Call: 718.941.3706. + – 6. Keep it clean. While washing the outside of the vehicle is obvious, most everything the vehicle ran over can also get stuck to the underside. Hosing off winter salt and road grime is a good idea. + – 7. Brake fluid is hygroscopic. What is hygroscopic? This means it is adept at attracting moisture. Moisture causes components to corrode and fail. Replace fluid and bleed system once a year. Brake fluid is cheap. Calipers, hoses, and sensors are expensive. + – 8. What should the tire pressure be on my Vehicle? The tire pressure should always be set to the tire manufacturer's suggest PSI (pounds per square inch) pressure specs. The specs can be found on the side of your tire. Properly inflated tires will give you better gas mileage and less tire wear. + – 9. How should i protect the interior of my vehicle? Protect the interior plastic by parking the vehicle in the shade. Use a window deflector screen, and applying a UV protectant to prevent the plastic and vinyl from drying out. + – 10. How Does waxing help vehicle maintenance?